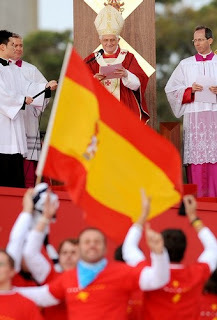 And it's official -- B16 has announced that the Spanish capital will host the 26th World Youth Day, with the celebration's 12th international gathering to take place in 2011. And to watch, fullvideo of everything remains available on the WYD Vid-page (scroll down the right sidebar to access the archives). Great job, Sydney... buona domenica a tutti... and, well, that's a wrap. SVILUPPO: Actually, there is one final last word -- and quite the coda at that. The angel understood her anxiety and immediately sought to reassure her. "Do not be afraid, Mary …. 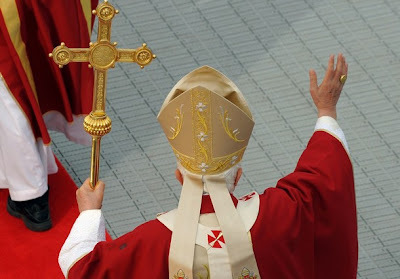 The Holy Spirit will come upon you and the power of the Most High will overshadow you" (Lk 1:30, 35). It was the Spirit who gave her the strength and courage to respond to the Lord’s call. It was the Spirit who helped her to understand the great mystery that was to be accomplished through her. It was the Spirit who enfolded her with his love and enabled her to conceive the Son of God in her womb. In fairy tales, the story ends there, and all "live happily ever after". In real life it is not so simple. For Mary there were many struggles ahead, as she lived out the consequences of the "yes" that she had given to the Lord. Simeon prophesied that a sword would pierce her heart. When Jesus was twelve years old, she experienced every parent’s worst nightmare when, for three days, the child went missing. And after his public ministry, she suffered the agony of witnessing his crucifixion and death. Throughout her trials she remained faithful to her promise, sustained by the Spirit of fortitude. And she was gloriously rewarded. Dear young people, we too must remain faithful to the "yes" that we have given to the Lord’s offer of friendship. We know that he will never abandon us. We know that he will always sustain us through the gifts of the Spirit. Mary accepted the Lord’s "proposal" in our name. So let us turn to her and ask her to guide us as we struggle to remain faithful to the life-giving relationship that God has established with each one of us. She is our example and our inspiration, she intercedes for us with her Son, and with a mother’s love she shields us from harm.